Alice Lucille McLamb Darden, 84, of 1090 Panhandle Road, passed away Sunday, September 9, 2018, in New York, NY. Funeral Service will be held at 3 PM, Saturday, September 22, 2018 in the fellowship hall of Piney Grove Baptist Church in Faison, NC, with Rev. Richard Walker, Reverend Joel Story and Pastor Richard Weeks officiating . The family will receive friends Saturday, from 2 PM - 3 PM, at Piney Grove Baptist Church just before the service. Interment will follow in the church cemetery. 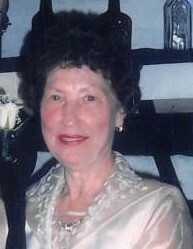 Lucille, born in 1933 in Johnston County, was the daughter of the late Marion Leo McLamb and Mary Lou Lee McLamb. She was a graduate of Clinton High School and Atlantic Christian College (now Barton College). Postgraduate studies were later pursued at East Carolina University and Southeastern Theological Seminary. She was a retired educator having taught English at Hobbton High School for over 32 years and a faithful member of Piney Grove Baptist Church where she helped establish the Fidelis Sunday School Class which she taught for nearly 50 years. In her retirement, she worked by her husband’s side on the farm, cooked and ministered to her church and community. After her husband passed away, Lucille enjoyed living part-time in New York City with her only child. She was loved and respected by everyone she met and lived her life serving God. In addition to her parents she was preceded in death by her husband, George Leonard Darden, sister, Ramona Rackley, her mother-in-law, Annie Ruth Thornton Darden and son-in-law, George Medina. Survivors include; daughter, Donna Darden of New York, NY; Charles H. Spangler, son-in-law of Shallotte; brothers and sisters, Marion Robert McLamb (Judy) of Clinton, Kathleen` Shipp of Clinton, Janie Lucas (Bobby) of Eastover, Judy McLamb of Clinton, Bonnie Noland of Clinton and Dixie Burgette (Larry) of Godwin and many loving nieces and nephews and special friends. Online condolences may be made to the family at www.crumpler-honeycutt.com. Flowers are welcome or memorials may be made to Piney Grove Baptist Church. Arrangements are by Crumpler-Honeycutt Funeral Home, 118 Fayetteville St., Clinton, NC 28328.